Smart, successful companies, make headline news every day for decisions that leave customers and employees scratching their heads — and frustrate and mystify the rest of us. 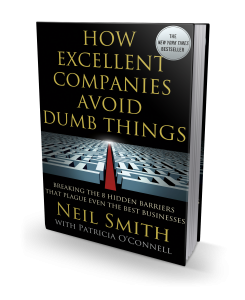 Here, Neil Smith, with more than 20 years of experience helping companies improve performance and simplify operations, reveals the hidden barriers that cause excellent companies to do dumb things and smart people within them to act in dumb ways. Drawing on his experience working with and helping transform top global businesses, including his latest client Bank of America, Smith has identified the 8 barriers that keep every company from performing at their absolute peak. He outlines a fast, proven, internally driven process to break down those barriers and release literally thousands of ideas for improvement. Rich with anecdotes and case studies, How Excellent Companies Avoid Dumb Things explains the 12 principles that detail the process for governing change and the process for getting company-wide buy in for improvement. 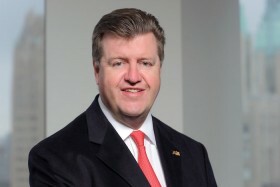 Neil Smith, a graduate of Harvard Business School and Keele University in England, and CEO of Promontory Growth and Innovation (PGI), has over 20 years’ experience helping large corporations dramatically improve performance and profitability by growing revenues and innovatively reducing costs. Smith has led initiatives across a number of industries with some of the best known companies in the U.S. and internationally including, Bank of America, Willis, and North American Van Lines. Patricia O’Connell is the former Management Editor at BloombergBusinessweek.com. She brings more than 20 years of writing and editing in a variety of subjects, including business, leadership, and strategy.